The second episode of Da Vinci's Demons delivered more of the show's entertaining blend of history and fantasy, set in fifteenth century Florence. Memorable sequences include a dissection, and Leonardo's testing of a war machine of his own design. These provide a useful opportunity to discuss Leonardo's actual development in these areas during the 1470s. In the first week's episode, Leonardo had mentioned his skill as an anatomist, although no demonstration was shown. This week, we are treated to a sequence which shows Leonardo's associates procuring a corpse and his study of it. However, like much else in the show, this sequence serves the plot, and was not intended as a faithful portrayal of Leonardo's approach to anatomical dissection. In the show, the exhumed corpse is that of the Jewish scholar hanged in the first episode, a member of the order known as the Sons of Mithras. Tom Riley's Leonardo is reminiscent of Sherlock Holmes in several sequences, enunciating his thought processes to his dazzled sidekicks, and the audience. Much has been written about Leonardo's anatomical studies, and their accuracy in many cases. These general descriptions tend to perpetuate broad misconceptions about Leonardo's anatomical studies, placing an emphasis on what what Leonardo drew accurately, often without clarifying their limitations. ...when confronted with evidence that contradicted theory, he tended to cling to the latter, going so far as to disbelieve - and reconfigure in his drawings - what was placed directly before his eyes. For example, he had the opportunity to examine closely a human brain (and those of many animals), and yet, when he drew the organ in cross section, he delineated an imaginative, three chambered cognitive system, based on the capricious speculations of medieval scholars interpreting the ancient writing of Aristotle. 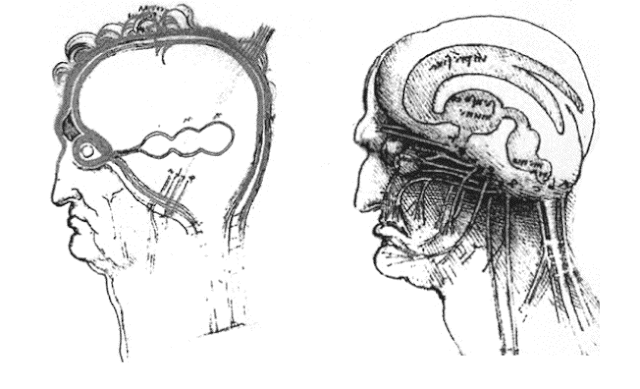 Leonardo's later attempt at drawing the ventricles of the brain provided a more accurate representation than his initial attempt, the latter being aided by wax moulds. *Leonardo traced the origin of sperm to the spinal column and base of the brain, following Aristotle and Hippocrates, not the internal plumbing of the male organ. *In certain drawings of the heart, Leonardo adjusted its geometry to reflect ideal proportions rather than observed dimensions. *Drawings of the female reproductive system were based on a pastiche of ancient teachings, drawings of animals parts and other sources, arranged into an idealised simulacra of the female body, rather than a representation of it made from observation. The computer generated (CG) backdrops recreating Florence in the fifteenth century have been quite dazzling, and fun to look out for. During a scene where Leonardo flees from the Swiss mercenaries, he manages to escape by cutting a rope tied to a scaffold, shooting him upwards onto a ledge of the Duomo. The panning shot gives a pleasant night time view of the Duomo and the surrounding neighborhood. 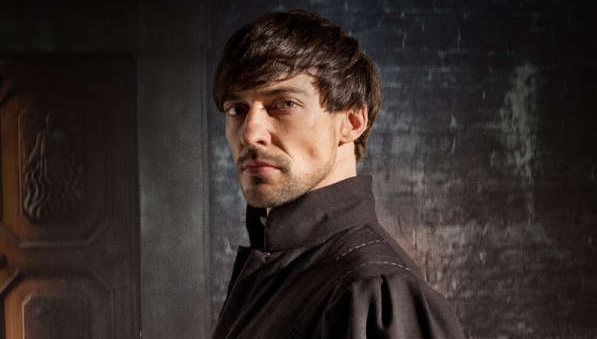 Count Girolamo Riario plays a more prominent role in this episode, portrayed in a decidedly sinister manner by Blake Ritson. No mention of his marriage to Caterina Sforza has been made in the show, although his familial relation to Pope Sixtus, and active plotting against the Medici firmly echo through the show and the historical record. Ritson's performance is thoroughly enjoyable, and it seems the writers are keen to cast him as Leonardo's evil nemesis, not unlike Professor Moriarty was to Sherlock Holmes. One particular scene mentions Swiss mercenaries acting on behalf the Pope. This is worth mentioning as having some basis in fact. Although the Pontifical Swiss Guards were not established until 1506, Pope Sixtus IV had forged an alliance with the Swiss confederacy in in 1479, in the interests of using Swiss mercenaries to protect Rome (and himself) from its many enemies. More highly regarded for his maritime projects and for military machines and fortifications, Martini would have been able to offer...Leonardo instruction in large scale engineering projects - and a professional role model - that Verrocchio could not. 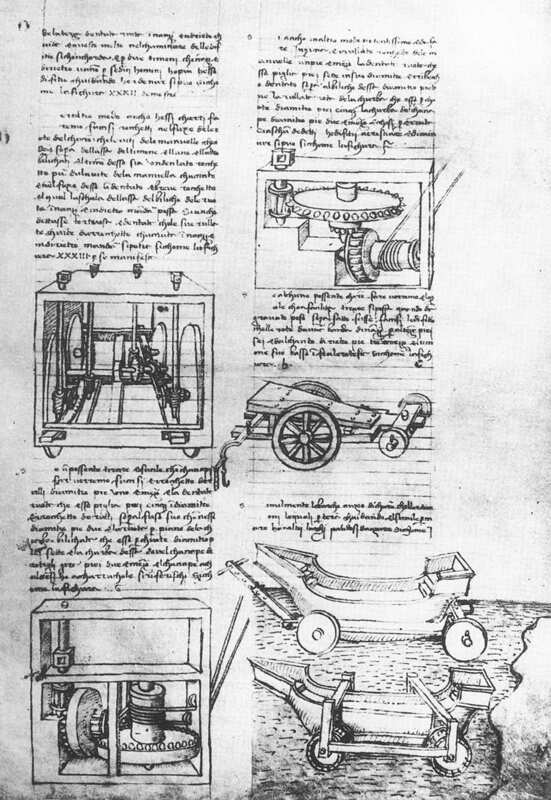 Leonardo later came into the possession of some of Martini's key manuscripts on engineering and architecture. The "exploded view" mechanical diagrams Leonardo is famous for having completed breathtaking examples of , owe a debt to illustrations seen in Martini's manuscripts. Francesco di Giorgio Martini - Illustration from Trattato de architettura. c.1470. The fantastical element of the story involving the search for The Book of Leaves takes an exciting turn as Leonardo discovers a key, which he believes will allow him to open a vault containing the book. As Leonardo searches for an accompanying key and a map, Riario is hot on his heels and the two share some memorably tense exchanges. Leonardo's second "revolving" canon prototype manages to kill six Papal guards in a showdown - a transgression which would have landed the artist in quite serious trouble had it occurred in real life. Ultimately, we discover Riario has the other key, and the vault they both search for is located in a part of the world that as yet lies undiscovered - the Americas. Leonardo for the Sistine Chapel? Attentive viewers may also note Riario making mention of Pope Sixtus IV's "new chapel". This was a reference to the famous Sistine Chapel, later to be frescoed by Italy's most famous artists, including Botticelli and Perugino (on its walls) and Michelangelo's work on the ceiling and wall featuring The Last Judgement. Completed in 1483, the chapel was later named after Sixtus IV, who ordered the restoration of a previous structure known as the Cappella Magna. Judging by how Leonardo's fresco projects fared, and his erratic experimentation with pigments and plastering methods, one could argue fresco was not a technique suited to his distractable nature. In the context of the show however, Riario's comment is meant as a diversion, rather than introducing a new plot point (or historical anomaly). Ackerman, J. Art and Science in the drawings of Leonardo da Vinci. National Gallery of Art Washington Podcast. (link) excellent podcast discussing accuracies and limitations of Leonardo's drawings. Thanks for the interesting and detailed review. I'm off to start watching the first episode via the link you kindly included above. I am constantly impressed by the breadth of your knowledge of the Renaissance. Keep up the good work! Que no haya salido aún la gran Caterina Sforza, que históricamente es mucho más importante que su marido Riario, es imperdonable e inaudito. En la época de la rebelión de los Pazzi, de esta segunda temporada, llevaban ya 5 años casados.